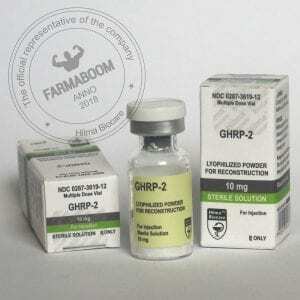 GHRP-2 is a powerful anabolic peptide drug that promotes muscle hypertrophy as soon as possible. It consists of a consecutive amino acid chain in the amount of six elements. These amino acids, when they enter the bloodstream, begin an active interaction with the pituitary gland and the pineal gland. Due to this, the production of somatotropin increases dramatically and anabolic, anti-catabolic processes are launched. The drug also has an interesting side effect – it stimulates the production of hunger hormone ghrelin, due to which the appetite on the course of ghrp-2 greatly increases. The amount of bad cholesterol in the blood is sharply reduced, fat burning is intense. Muscle mass is rapidly increasing. Bones, cartilage and tendons are strengthened. The peptide has an anti-inflammatory effect on the body of an athlete. Increases strength performance, facilitates training due to the increased energy content in the body. Rejuvenates at the cellular level. GHRP-2 does not have any side effects, and the athlete may not worry about their health. The drug does not adversely affect the liver, it immediately enters the blood. 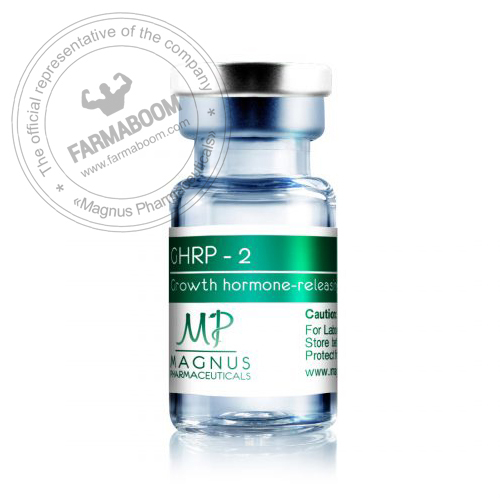 The only thing that can be noted – GHRP-2 with prolonged use may increase the increased content of the body’s hormones cortisol and prolactin. Usually, after the course, the indicators return to normal, but if they are very disturbed by the athlete, then for safety, you can drink prolactin inhibitors after the course, and essential amino acids BCAA and protein isolate will help to get rid of cortisol. The most optimal dosage is based on 1-2 μg of the drug per kilogram of its own weight. To obtain the best effect, it is recommended to use the combined course GHRP-2 plus CJC-1295. These peptides mutually reinforce each other (synergistic effect). The course length should not exceed eight weeks, otherwise there will be a resistant perception of the organism to the substance (it will not react to it). After the course it is better to take a break for 2-4 weeks, and then you can repeat. Reviews drug purchased in our online store, has received excellent.